Sky Habitat... only if you shell out $1,700psf up! 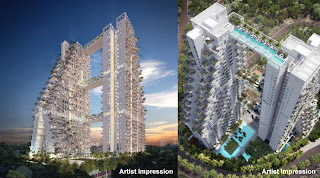 When CapitaLand's designer condomiunium project, Sky Habitat, goes on sale on April 14, it may set a new record for the prices of residential units located in suburban areas. Ahead of the condominium's launch, some market watchers estimated that a unit at Sky Habitat could sell for between $1,700 and $1,800psf. CapitaLand was tight-lipped about prices of the units and it says they will be available closer to the launch date. The 509-unit Sky Habitat is designed by renowned architect Moshe Safdie - a premium that is likely to be reflected in its pricing. CapitaLand paid $550 million for the condominium's site at Bishan Street 15 through a government land sales tender in February 2011, which some property analysts say was a hefty sum for the time. The developer believes the strong sales momentum seen in the first quarter will continue. "We always believed that the residential market is a function of many factors, the key one being global sentiment," CEO of CapitaLand Residential Singapore Wong Heang Fine said. "Interest rates are still very low, the job market is still very good, so naturally there would be a response from buyers," he added. So what happens when interest rates begin to rise and the job market starts to go sour....or should we all just live for the moment while it lasts? It's not a problem, we concur, if one can pay the unit off fully in the next 2 or so years! 8 comments to ''Sky Habitat... only if you shell out $1,700psf up!" I think Buyers would be mostly those high income earners who do not mind losing a few hundred thousand dollars in the event property market drop sharply. This kind of pricing way too high for many. If Capland prices this at $1700, wouldnt they be shooting their own D10 D'Leedon in the foot? That project is also v near a mrt station and has the "Nanyang Primary" factor too! Are you folks planning to visit the showflat and provide a review? I am interested to see why they charge so high..got silver taps or what..heh heh. THIS is one that the wife and I will definitely try to make time for. So stay tuned! Dear Folks@Proptalk, will u be issuing any cheque for Sky Habitat?